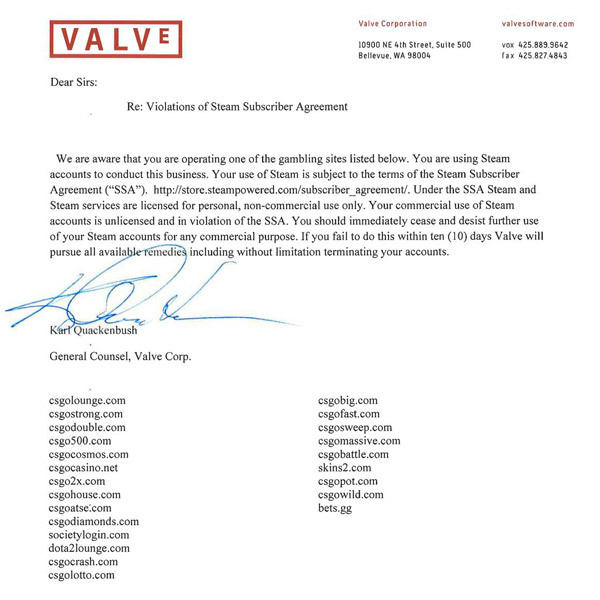 Valve have released another wave of 'cease and desist' letters. I am sure many of you have already witnessed the public criticism towards CSGO gambling sites that allegedly promote youth gambling over the last couple of weeks. Valve has already issued an official statement regarding this issue and started sending out letter to some of the most popular gambling sites out there. During the first wave of cease and desist letters, gambling sites such as CSGO Lounge (by far the most popular betting site that has been operating at its max flow for the past few years ), CSGO Lotto and CSGO Diamonds and similar. In those letters, Valve gave the sites a 10 day deadline until which they have to stop with all of their operations and shut down their sites. Some of the sites have already obeyed Valve’s letters, most likely frightened by big time lawsuits that may occur if they don’t obey the given terms. Despite Valve’s strict policies, some of those CSGO sites that received letters in the first wave are still running and are, as it seems, not really caring about Valve’s reaction or the public criticism that has been exploding over the course of last week or two. Just 9 days after the first initial wave of Valve’s letters, another one has allegedly being sent out to 20 additional CSGO gambling sites. The second wave targets sites such as CSGo Shuffle and CSGO Jackpot who have been in the vocal point of many speculations after conversations spread across the internet claiming connections between Vulcun (one of the leading gaming industry giants), James “PhantomL0rd” Varga and CSGO Gambling sites. Despite Vulcun denying these accusations, we are still to see whether the sites will shut down (as Valve is politely asking them to) or will they remain online and wait for further events that will most likely occur after the 10 day shutdown deadline. Take a look at our CS:GO betting sites review for more reliable esports bookmakers like Pinnacle(e)sports or esports betting at bet365. Besides CSGO Jackpot and CSGO Shuffle, additional 18 sites have been targeted by the second wave of Valve’s letters, including the likes of CSGO Skin Arena and Fanobet. As we already stated above, some sites have already shut down the entirety of their operations (sites such as CSGo Double and CSGo Wild) while many of them (Including the well known CSGO Lounge) still remain online a the time of writing this article. According to Valve, all 20 sites from the second wave of their cease and desist letters have been using their Steam accounts commercial purposed which directly violates the Steam user agreement (that thing you have to check in order to accept while first registering your account). As was the case with the first wave of letters, the second ones are also giving the 10 day shut down deadline, after which Valve is most likely to pursuit their goals in different ways ( read = lawsuits ). The entire fuss that has been going on around Counter Strike Global Offensive betting sites has reached international levels and the entire gaming industry has its eyes on both Valve and the alleged sites, waiting to see how will the situation resolve in the upcoming days ( next Wednesday is the end of the 10 day shut down deadline for the first wave of letters after which Valve will most likely have to take up more extreme measures to battle these sites).